It’s not enough to simply add comments to your site and expect a community to emerge. If you want great discussions to happen on your site, you need to participate in the conversation. But how? In this post, we put together five easy ways you can interact with readers in the comments. We incorporated some of our favorite examples for each idea that showcase publishers who know how to do it right. If you have examples of successful tactics for engaging readers from your community, share it in the discussion below. One of the easiest ways to engage with readers is to answer their questions. There’s nothing more discouraging than having your question ignored, so get in the habit of answering questions from readers. If you don’t know the answer, mention someone on your team who might be able to jump in to respond. Over at Nom Nom Paleo, author Michelle Tam is quick to reply to readers’ inquires for advice on various ingredients and cooking methods. As a result, readers regularly post questions on her latest recipes. Reporters at local news site Berkeleyside respond to questions from readers to help them stay informed on the issues and developments that impact the local community. Comments offer a great opportunity to obtain feedback and insights from readers to help you create more interesting and relevant content. Asking readers for their thoughts lets them know that you are actively listening to what they have to say, which is key to forming a lasting relationship with your audience. Make first-time commenters feel right at home by welcoming them to the community. This increases the likelihood that they will stick around and keep coming back to participate in discussions. 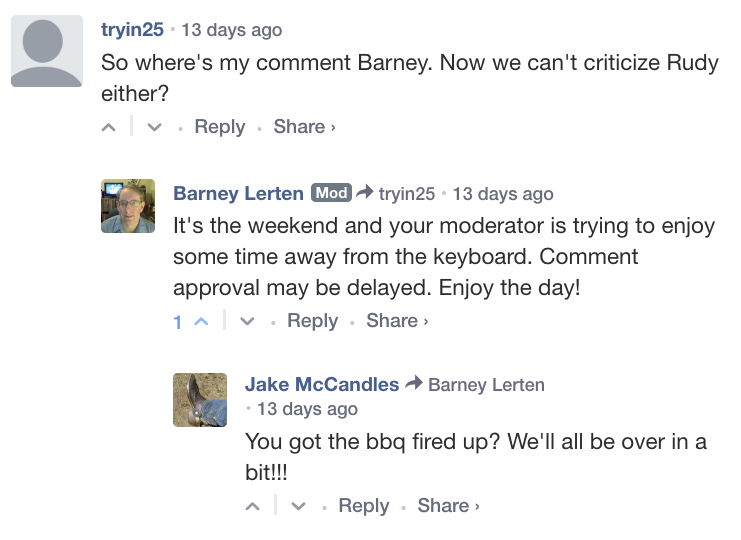 To identify first-time commenters, check out the user’s commenting history by visiting their Disqus profile or searching for their most recent comments on your site using the Moderation Panel. If you have a Disqus Pro plan, sort the Community Members table by “First Engagement Date” to find these users in just a few clicks. One of the most common questions we hear from commenters is about why their comment was removed. We created the Comment Policy feature to make it easier for publishers and readers to be on the same page about how comments are moderated. Moderators are people too! They have a tough, but essential role in any community. Don't be afraid to remind readers of this, like KTVZ's moderator does in the example below. 💬 How do you engage with readers in the comments?